John Montgomery Ward (March 3, 1860 – March 4, 1925) was an American Major League Baseball star pitcher, shortstop and manager. Ward was born in Bellefonte, Pennsylvania, and grew up in Renovo, Pennsylvania. He later successfully challenged the player reserve clause, leading to the formation of a new baseball league, the Players' League. Ward's first season with the Grays was a successful one, going 22-13 with a 1.51 ERA. 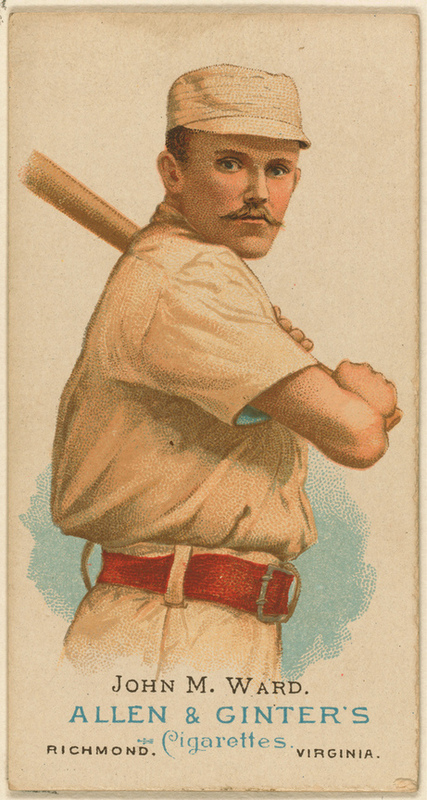 He played that season exclusively as a pitcher, but during the following two seasons he played increasingly in the outfield and at third base. Ward had his two finest seasons as a pitcher, going 47-19 with 239 strikeouts and a 2.15 ERA in 1879 and 39-24 with 230 strikeouts and a 1.74 ERA in 1880. Perhaps more remarkably, he pitched nearly 600 innings each year (587.0 in 1879 and 595.0 in 1880). As a 19 year old pitcher, he won 47 games and led the 1879 Providence Grays to a first place finish. In 1880, he began to play other positions and also expanded his leadership role to include managing when he became a player-manager for 32 games, winning 18 of them, as the Grays finished in second place. On June 17, 1880, Ward became only the second man in history to pitch a perfect game, defeating future Hall of Famer Pud Galvin 5-0. Lee Richmond had thrown baseball's first perfect game just five days before, on June 12. The next perfect game by a National League pitcher would not happen for 84 years, when Jim Bunning pitched a perfect game in 1964.